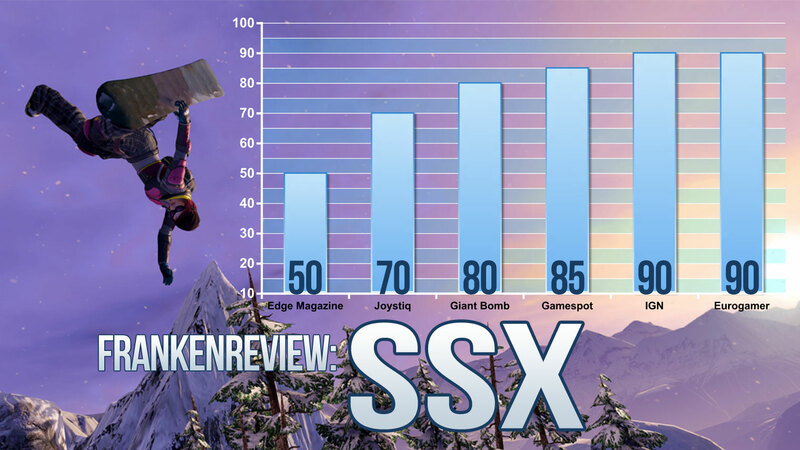 Just like the fine sport of extreme snowboarding itself, SSX's review scores start off pretty high and then suddenly drop. OK, so technically they start of low and then abruptly rise, but that doesn't work as a snowboarding metaphor. Either way, the SSX series has triumphantly returned, making its big debut on current generation consoles that aren't the Wii. With ridiculously fast action, nine locations to master, endless online challenges to rise to and the ability to replace the so-so soundtrack with music of your own choosing (Brahms, here), that chart up there should be more of a plateau, shouldn't it? Come on, folks, you should know by now that the only thing more tricky than video game snowboarding is getting video game reviewers to agree. At the turn of the millennium, the original SSX kicked off EA BIG's run of high-quality egocentric sports titles, paving the way for the punishing thrills of NFL Street and the showboating silliness of NBA Street. 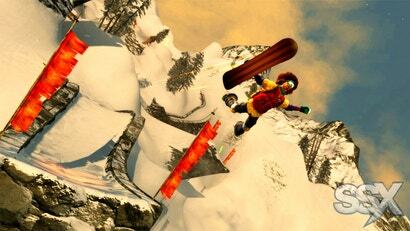 The extreme snowboarding sim was the most universally accessible and embraced of the stable, delivering incrementally more ambitious sequels that didn't stray too far from the original formula of big stunts, bold environments and solid mechanics. The outfits were eccentric, but the gameplay was robust — a happy marriage of style and function. 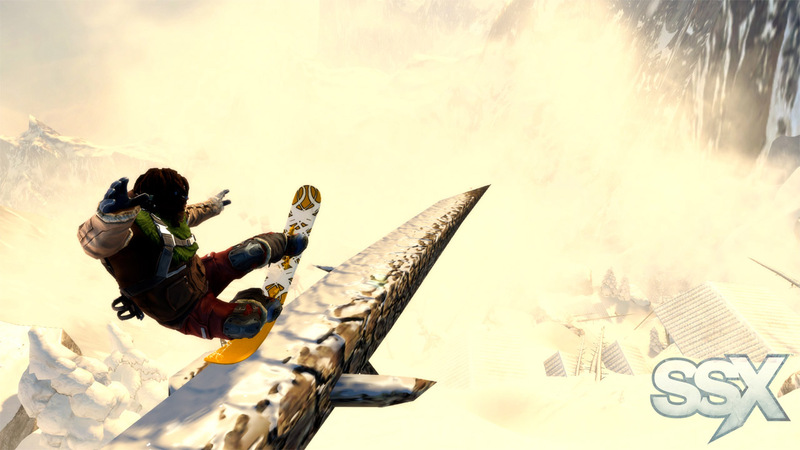 The void left by SSX since its prior outing in 2008 has been slowly filled by a shift toward the realism pioneered by EA's own Skate, a response to the increasingly gimmicky takes on extreme sports by brands such as Tony Hawk's Pro Skater. It's interesting, then, to find EA partially resorting back to zany form for this latest entry, albeit with a greater sense of mortality to your powder trip and a few pages taken from Need For Speed: Hot Pursuit's online playbook. 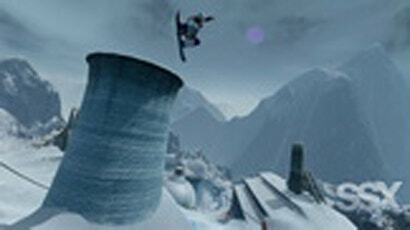 Easy to learn without any instruction, SSX's controls are nuanced and eventually demand competence. The sloppiness that I got away with when I began gave way to more deliberate maneuvers, and then mastery. Through a combination of retrying levels and using the built-in rewind button (points and time are penalised, but it's enormously helpful), I learned how best to finesse my way across all manner of terrain, not to mention through the air. That mastery, unfortunately, means diddly-squat at several unannounced points in the main campaign. 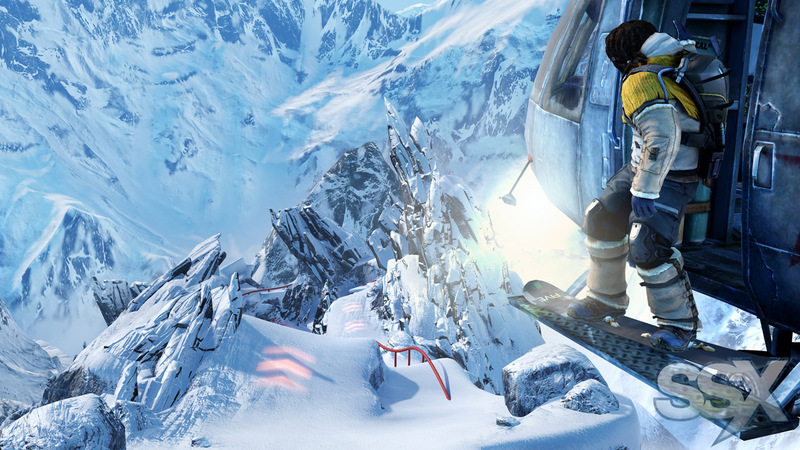 Between AI that never misses a jump and courses that sporadically fall apart in massive chunks, SSX plays downright cheaply from time to time. The fun of mastering every turn and figuring out the best line down a mountain for maximum points is eroded when levels are pitch black and littered with sheer dropoffs. The nine major drops are especially frustrating, requiring repeated, agonizing playthroughs to pass and rarely bringing any fun at all to the experience. The developers seem to know how frustrating it can be, offering a chance for you to skip the level and progress after several consecutive deaths (yes, even the nine "Deadly Descents"). Regardless of which style works for you, the greater point is that on the slopes, the action feels fantastic. SSX has always been about speed and the outright obliteration of the laws of physics, and this SSX takes that mantra to absurd new heights. I feel I am in no way speaking out of turn when I say that this SSX is light years faster and more intense than any of the games of yore. Go ahead, pop that copy of SSX 3 back into your PlayStation 2, and then give this one a spin. Chances are, the old game will make you feel like you just graduated from an Edsel to a Trans Am. The bonus is that it does this while maintaining a sharp visual style and an even sharper frame rate. The game simply doesn't slow down on either the Xbox 360 nor the PlayStation 3, save for very, very minor bouts during some of the hairier races. It's nothing that's going to affect your play, however, though at times, you might actually pray for a bit of slowdown, just so you can regain your bearings. The eclectic soundtrack includes shimmering pop, funky R&B and pulsating electronica, and when you leap from a mountain to catch big air, the music fades, as if it emanates from the surface down below. When you hit the ground, it kicks back in at full strength. If you've tricked enough to fill up your boost meter, the music gets remixed into Run-DMC's "It's Tricky," which reprises its significant role from SSX Tricky in this game. Being in the "tricky" state also means you have unlimited boost while it lasts, and you can do ubertricks, which are worth more points. Score enough points in this mode and you get access to even wilder super ubertricks. The relationship between the game's adapting music and your actions gives your landings a satisfying sonic impact that complements the physical one. Throughout the entire game, RiderNet keeps track of your progress. Anyone who has played the last few Need for Speed games will recognise RiderNet as an Autolog-inspired online resource. From the second you load up SSX, RiderNet alerts you about what your friends are doing. Any scores posted or collectibles acquired pop up, and the game sets challenges for you based on your friend's scores. 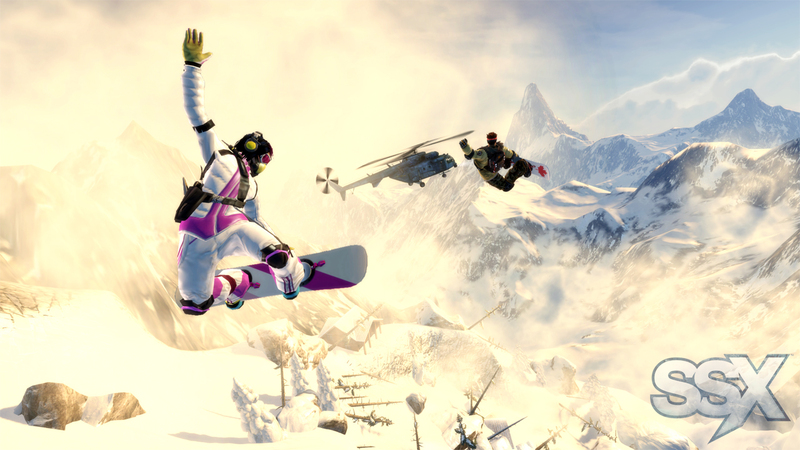 Multiplayer in SSX comes in the form of Global Events, a constantly updating series of challenges open to everyone in the world (or just you and your buds). EA has challenges going all the time, and you can just drop in and try and post a high score or fast time. As you're racing along a course, other players doing the same show up alongside you in a crazy simultaneous event. For some, the lack of traditional multiplayer is a problem, but with the custom events that let you invite only your friends, you can get near that experience. 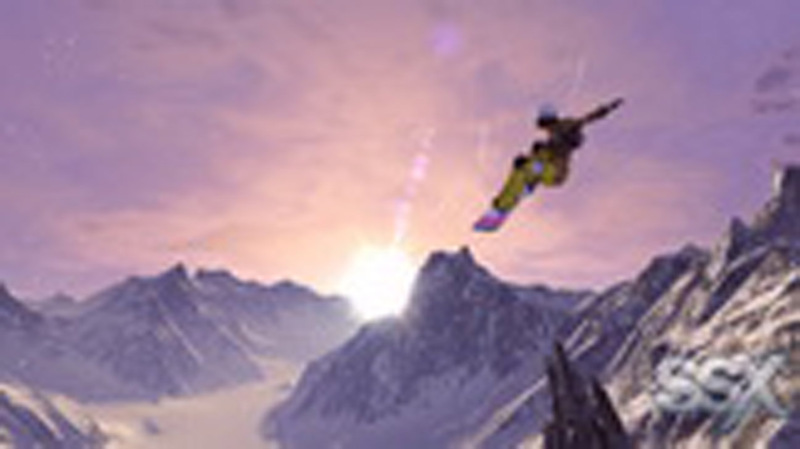 Plus the Global Events and RiderNet combine to open up multiplayer in a much broader and more modern way that allows you to play SSX at your own speed and on your schedule, while still keeping that competitive edge with your friends. At times, the game threatens to burst its seams with ideas. Add-ons such as body armour, ice axes and wingsuits can be added to your character's load-out, adding unique abilities and advantages. Meanwhile, Geo Tags are temporary collectibles that you can place in the world while rewinding a section of a course, earning you additional points for as long as they go "uncollected" by other players in the world. Discontent with mere trophies and achievements, EA Canada throws in over 200 badges to be won for completing various meta-tasks, while the shop structure adds a degree of luck to what items you can purchase at any given point. SSX is rich in ideas but, rather than overwhelming the experience or compensating for a weaker core, they embellish. Nevertheless, the excitement at the heart of SSX remains pure. You leap and your eyes measure the distance, thumbs squeezing out every rotation they can before you need to relent and re-align. One final grind throws you into Tricky, setting you afire with even more insane dexterity. No matter what else you're being tempted with purchasing, that feeling's still worth the price of admission. I'd write an ending blurb but I'm too busy snowboarding. From what I was told the characters in explore mode are developers scores, which means they are terrible at 'Trick It' but strangely good at 'Race It' I'm really enjoying the game though I loe it how your able to upload your own playlists. I picked it up yesterday and got a couple of hours with it last night. Its soooo good. Takes me all the way bak to those very first days of SSX! Tricky - Watch your Combo(Bottom Left) and Muliplier(Bottom Middle) at the bottom once you hit a 20x multiplier it is safe to allow your Combo score to trigger. Always tweak your moves and use trick combinations aswell NEVER duplicate your moves at super tricky mode it normally rotate between your signature move and a combination tweak. Hitting X and Y(Xbox) during your on the ground can help maintain your combo to prevent it from trigeriung before a 20x multiplier. Don't fall! it weak break your combo and lose many multipliers, pretty much never overextend on a trick move . Never premind or jump on ramps going high in air will slow you immense the trick is to obtain combination tricks boosts until you gain tricky and go the shortest route while forward curve boosting. Avoid grinding unless its a shortcut., Race it it pretty much a trial and error until your acquinted with the map. Edge can go away now its old boring and hasn't changed in like what 10 years? 20? 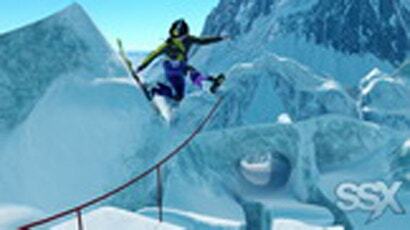 The original SSX was brilliant, so is this one. The MP challenges make it a must have title. I wish they'd bring back Amped in the style of Amped 2. As it's the best snowboarding game (Amped 2) bar Snowboard Kids. I didn't see anything in the gameplay vids I watched that said this game did more than On Tour, and I already liked the Iron Maiden/Rock soundtrack.